Vista Utilities by Smart PC Utilities is a free utility that provides the user with a direct and easy access to all Windows Vista tools and utilities. By using Vista Utilities, it can help the user to access all the features of their Windows Vista easily and faster without to browse through Windows Vista Start Menu, Control Panel or through systems folders to find the correct utility. Beside that, the user also can access all Windows Vista programs and utilities such as system tools, security tools, network tools, multimedia programs and even games. It also has ready made MS Dos commands which enables user to perform difficult task with simple clicks like NTFS Converter Utility, Cab Files Maker utility and etc. Access almost Windows Vista programs of computer by just accessed through the system tray. It can be set to hide to tray or click to display a complete context menu to access the vista features. It also enhanced each utility with tool tips which will help user to identify the selected utility and its function easily. Includes a lot of ready-made MS Dos commands which enable to perform many complicated tasks with simple click such as NTFS Converter utility, Cab Files Maker utility and others. It also classified all Windows Vista Utilities into some categories and even sub-categories for finding the correct utility easily and simple. 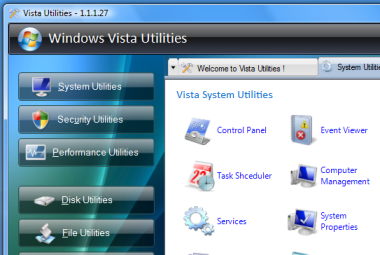 Currently, the latest version of Vista Utilities 1.1.1.27 is available for free download.